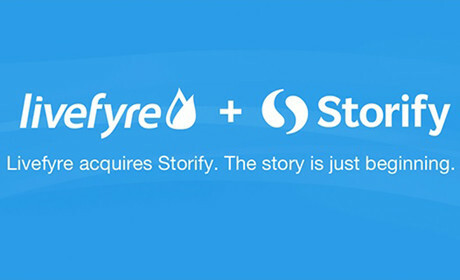 Social media curation and conversation platform Livefyre has announced the acquisition of Storify. Storify, a tool used by journalists to curate stories by dragging and dropping social media content, will continue to offer a free service to users. Storify started to monetise earlier this year creating Storify business, aimed at journalists, and VIP, offered to publishers. The acquisition will result in the two also being merged into a single paid-for option. Livefyre enables news outlets and brands to integrate real-time social content into their websites, and has clients including the New York Times, Wall Street Journal and Conde Nast. Its StreamHub platform is a paid-for option aimed at digital publishers and includes a liveblogging tool, live chat and a feature which allows publishers and brands to curate content from around the social web in real-time. "Acquiring Storify made perfect sense," Jordan Kretchmer, founder and chief of Livefyre, says in the release. "Livefyre powers social media and user engagement on the largest media properties and brands on the web. Storify also delivers a unique and vital curation tool for journalists and editors at many of those same companies." Kretchmer explains that Livefyre enterprise users will be able to curate Storify content from within the dashboard they use to manage all of their social and user-generated content. He says that with the addition of Storify, "StreamHub is now the only real-time platform that enables both editorial and automated content curation from all the major social networks including Twitter, Facebook and Instagram". It is worth noting that some liveblogging platforms do allow for a mix of editorial and automated curation and do allow users to bring in content from a range of social networks. Storify, which launched in 2010, quickly became become popular among journalists who use it to tell stories with the help of tweets, YouTube videos and Instagram images. According to the release, the award-winning platform is now used by nearly 1 million journalists, agencies and brands to tell stories online, including the BBC, CNN, Al Jazeera, the Wall Street Journal and New York Times. Livefyre, which has offices in San Francisco and New York, recently launched a native ad offering. Storify's functionality will soon be integrated into this new offering, the release explains. Storify founders Xavier Damman and Burt Herman are both joining Livefyre. According to the release, "Damman will continue to oversee the Storify product, and Herman will lead relations for all of Livefyre’s editorial users and partners". "Together, we'll take Storify to the next level and will fulfill Livefyre's vision of powering social everywhere," Damman says in the release. Herman adds: "We created Storify to unite journalism and social media, helping to tell stories that come alive with eyewitness reports from where news is happening. "Joining Livefyre means our users, including journalists and now brands and agencies, will be able to integrate social media easily across their websites, and also into mobile apps, ads and TV broadcasts. We can now also help publishers make more revenue through native ads." Update: We have added a line to explain that like StreamHub, other platforms allow for a mix of automated and editorial curation.